Crowned by a Forteresse Royale, Chinon can also boast that Joan of Arc and Jacques de Molay slept here. The huge Forteresse Royale de Chinon dominates the hill, with the town of Chinon (map) clustered beneath it on the bank of the Loire. With good train connections to other large towns, its selection of hotels and restaurants, and its location west of Tours, Chinon is a suitable base for visits to the châteaux west of Tours in the Loire Valley, including Azay-le-Rideau, Langeais, Ussé and Villandry. Besides the forteresse (or château), Chinon is surrounded by vineyards, which means not only is the wine good and varied, but also that there's lots of local cuisine to be tasted. 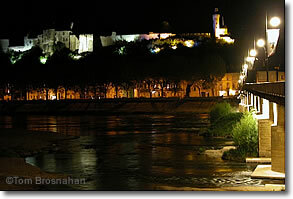 The Château de Chinon, floodlit at night, at the end of the bridge across the Loire.